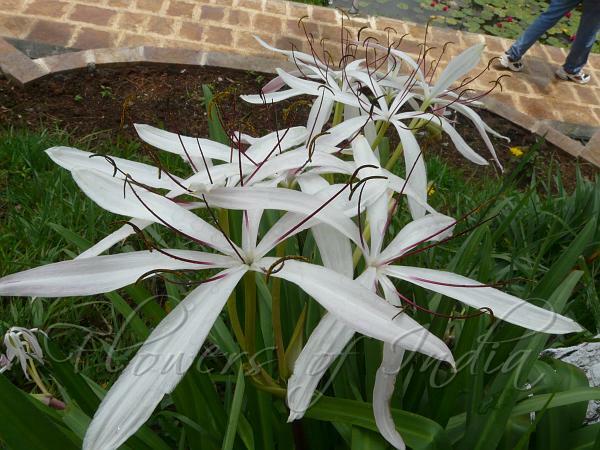 Himalayan Crinum Lily is a beautiful species of Crinum lily with large, white flowers borne in a dense umbel of 6-12, with slender spreading petals and a long green flower-tube which looks like a flower-stalk. Stamens are prominently reddish. The flower cluster is borne atop a slender leafless stem 1-2 ft tall. Petals are linear-lanceshaped, 5-9 cm long, with the flower-tube very narrow, 8-10 cm long. Style is long, purple in color. Leaves are 10-12 cm long, spear shaped, 2.5-4 cm broad. Bulb is large, 5-7.5 cm in diameter. 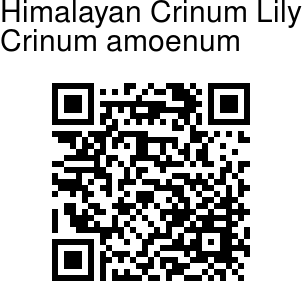 Himalayan Crinum Lily is found in the Himalayas, from C Nepal to NE India and Burma, at altitudes of 700-1700 m. Flowering: May-June. Photographed in Shillong, Meghalaya & Chandel, Manipur.